We begin our publication with the historical part, commemorating the deed of Stanisław Kramsztyk and his outstanding personality. This historial part is followed by articles dealing with some most important current problems in various branches of geophysics and extraterrestrial space. Stanisław Kramsztyk has a very special position in the history of popularization of natural sciences in Poland. He was the author of pioneering popular scientific articles published in the second half of the XIX century, and an outstanding and very talented teacher at Warsaw schools; he was also a person strongly involved in social problems and patriotic actions. Kramsztyk was born in Warsaw in 1841 to an assimilated Jewish family, known from its patriotic attitude and very talented for natural sciences and literature. Kramsztyk was one of the first graduates of the Faculty of Mathematics and Physics of the Warsaw Main School (the predecessor of Warsaw University). The times he lived, overwhelmed by the political repressions after the 1863 uprising against the Tsarist rule, were not favorable for professional engagement in science, so he had to start working as a clerk and teacher. However, his passion for science was so strong that he has in fact never quit scientific activity, finding his place in the field of popularization. He dealt with a very broad range of subjects, and wrote several thousand publications. These publications covered physics, geophysics, physical geography, meteorology, astronomy, and even biology and chemistry. His texts, addressed to a reader at the high-school level, were written in beautiful language, with a great care for attaining a precision in expressing the thoughts and for making the reasoning fully understandable to the reader. He has often advocated the importance of the popularization of science for the society and put the emphasis on the form of popular science articles, which he considered crucial for making such a literature interesting for a broad range of readers. Kramsztyk was among the first scientists to propagate the knowledge on geophysical sciences in the Polish society. He introduced the term "geophysics" to the title of his remarkable paper "Scientific Notes in Physics, Geophysics and Astronomy" published in 1893, thus becoming one of the first users of this word. 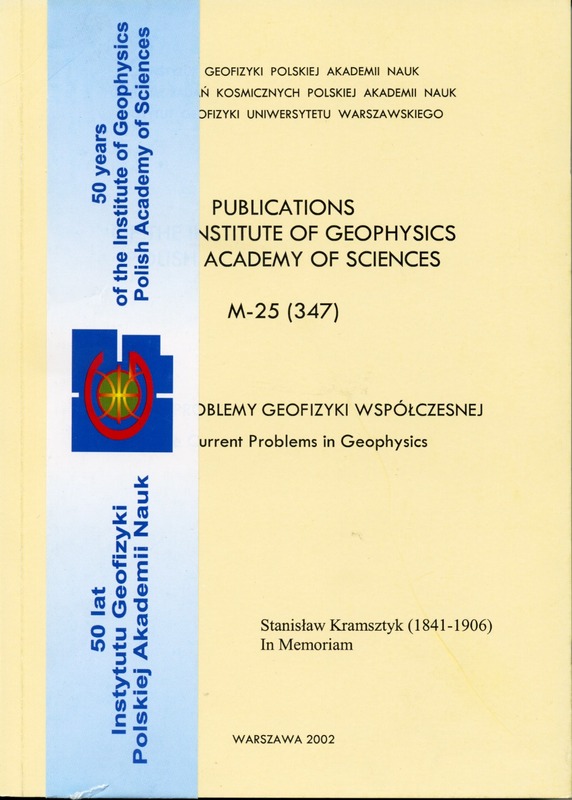 It was not only the very term "geophysics", but also geophysical topics and some other geophysical terms (e.g., a geoid) that he tried to introduce to Polish language and to make the Poles familiar with. His actions were successful owing to the unusual popularity and attractiveness of both his articles and lectures. Kramsztyk dealt with problems relating to the Earth physics not only in the above-mentioned "Scientific Notes", but also in his book "On the Form and Weight of the Earth", published in 1882 (based on a lecture that had been delivered earlier), in the first volume of "Selected Works" published post-mortem in 1909, and in numerous articles in Warsaw newspapers. Another field of his activity was education and school programs. 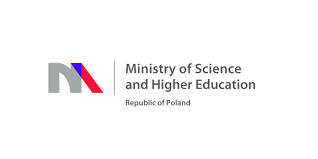 Kramsztyk has been undertaking efforts to bring back the previously removed natural sciences into the official school curriculums. He has been poining out their didactic values, relating not only to the knowledge itself but to the methodology as well. He was especially eager to introduce physics as an obligatory course already from the earliest classes. He was one of initiators of including the natural sciences into the programs of girl's schools, in which he has been teaching this subject for many years. Stanisław Kramsztyk died in Warsaw in 1906. He is to be remembered as an outstanding person of his times, of great merits for Polish society in a variety of fields, very honest and hard-working. His achievements in popularization of natural sciences, and geophysics in particular, deserve great esteem. Author(s): Gadomska B., Maj S.
Edward Stenz was born in Warsaw on January 22, 1897. After completing secondary education in philological school in 1917, he studied physics at Warsaw University in 1917-1923. He obtained Ph.D. degree at the Stefan Batory University in Wilno in 1926. Until 1937 he worked at the Institute of Geophysics and Meteorology of Lwów University, the Institute of Physics of Warsaw Polytechnic, and the State Geological Institute. In the years 1937-1939 Professor was the head of meteorological observatory in Tatra Mountains (Kasprowy Wierch). During the Second World War, Edward Stenz stayed in Afghanistan, teaching at the Department of Mathematics and Natural Sciences of Kabul University, and organizing the Afghan Meteorological Service. After returning to his native country in 1948, Professor received the degree of doctor habilitatus at the Nicolas Copernicus University in Toruń, on the basis of the dissertation Dry climate problems and evaporation, and - in 1954 - he was nominated professor and head of the chair of Physics of the Lithosphere, at the Department of Mathematics, Physics and Chemistry of Warsaw University. Edward Stenz was the first Editor-in-Chief of "Acta Geophysica Polonica" and deputy-director of the Institute of Geophysics, Polish Academy of Sciences. Along with his involvment in research, Professor Stenz was very active in popularization of geophysics: his popular lectures, articles and books are well-known and written in an interesting manner. The most important work of this kind is the book The Earth (Ziemia). This monograph, edited in 1936, contains five parts: The Earth as a Planet, Physics of the Globe, Physics of the Seas, Physics of the Atmosphere, and Cosmic Relationships. This very famous book was reedited in 1953 under a new title Physics of Earth's Interior, Seas and Atmosphere. 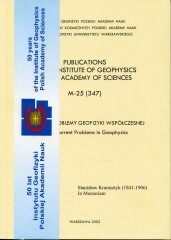 Other publications from same domain include the brochures: What we know about the interior of the Earth (1954), What we know about the age of the Earth (1955), Polar lights (1953), and the little monograph The optical phenomena in the atmosphere (1950); this last publications serves as a kind of guide-book for the observers-amateurs. Not great in volume, but of great importance was the brochure I choose the profession of a geophysicist. Professor Stenz used to write to many different magazines, like "Mathesis Polska", "Urania", "Kosmos" and othe and even to daily newspapers. Professor Edward Stenz had many important scientific achievements, but it is his popularization activity, with easy and beautifil texts, that inspired many young people to be interested in natural sciences; his merits in this field deserve high esteem. The paper presents development of geodynamics leading to the physical theory of dynamics of the mantle and crust motion. The controversies of 19 century scientists concerning the origin of the terrestrial heat energy and the first geodynamical models are discussed at the beginning. The next sections treat about main stages of the development of the global tectonics: the continental drift hypothesis and the plate tectonic theory. The rest of the paper is devoted to the mantle convection theory as a physical basis of the geodynamical processes. In four subsections we discuss: the necessity of the mantle convection, numerical models of the convection as the main method of its theoretical investigations, seismic tomography as the main method of observational investigation and gravitational effects of density inhomogeneities in the mantle. In the conclusion we state that quantitative models of the basic geodynamical processes could be developed within 10-20 years. This paper discusses in a synthetic manner a role of palaeomagnetism for the Earth's sciences. It starts with the presentation of the current views on origin of the geomagnetic field in the Earth's core, followed by a short discussion on encountered difficulties with solutions of magnetohydrodynamic equations. Subsequent paragraphs deal with an origin and evolution of the palaeomagnetism, its basic assumptions and paradigms, most important types of the natural remanent magnetisation (NRM) and its stability in geological time, followed by essential aspects of palaeomagnetic methodology and principal applications in geology, palaeogeographic reconstructions considered to be most important. The latter has been exemplified by reconstruction of the continental drift in the Palaeozoic time, that utilized both palaeomagnetic and palaeoclimatic data. Paleomagnetism is the branch of geomagnetism concerning the past of the geomagnetic field. The object of paleomagnetic study are rocks. The rocks containing magnetic minerals when placed in an external field behave as any magnetic material. It means that under certain circumstances they may acquire remanent magnetization parallel to the external field. This remannece is called the Natural Remanent Magnetization NRM. The main magnetic minerals that behave as ferrimagnets and may therefore be the carriers of magnetic remanence are mainly various iron oxides belonging to the titanomagnetite and hemoilmenite series, iron hydroxides and pyrrhotites. TItanomagnetites, when oxidized, may form another ferrimagnetic series called titanomaghemites. The very important property of magnetic minerals is their Curie temperature Tc. Each mineral has its own Tc above which it has paramagnetic properties. The rocks containing the said minerals, when cooled from above their respective Tc's to the ambient temperature in the presence of the geomagnetic field, acquire the NRM of thermal origin. The history of applying the methods based on natural electromagnetic induction generated by currents flowing in the ionosphere and magnetosphere to the study of the Earth's mantle structure had begun more than hundred years ago. The first, very simple models were only able to show that the Earth behaves like a well-conducting body. Presently, the use of advanced inversion algorithms makes these methods capable of evaluating the electrical conductivity distribution within the Earth down to 2100-2200 km depths. The paper begins with a brief outline of the present state of knowledge about the Earth's mantle structue obtained mostly from seismic surveys. Then a review is made of electromagnetic methods used in the studies of the Earth's mantle structure and the methods for experimental data collecting and processing. This is followed by a review of the models of electrical conductivity distribution in the Earth's interior obtained in the last decades, including our own, recently developed models. Finally, the results obtained are analyzed and an attempt is made to evaluate to what extent the information about the deep structures acquired be electromagnetic methods is reliable and brings its individual contribution to the general state of knowledge. Seismic models of the continental lower lithosphere obtained from interpretation of body P waves are discussed. The models of the lower lithosphere differ in the character of velocity distribution, the number of layers, and the presence of the lower-velocity layers. This is a consequence of inhomogeneity of the lower lithosphere, but also follows from the differing accuracy and quality of seismic data. Over the last two decades, big international seismic experiments were made in the central and northern Europe to investigate lithospheric structure, particularly beneath the Precambrian East European Craton. The velocity of the sub-Moho uppermost mantle is 8.0-8.3 km/s. Besides very good-quality intracrustal and Moho phases, correlated phases from the lower lithosphere, beneath the Moho were recorded. Good quality seismic records obtained up to about 600-1000 km from the shot points permit to investigate structure down to about 100 km depth. Qualitatively new results were obtained from observations of a high-frequency scattered phases on super long-range profiles (>3000 km). A sub-Moho boundary layer with thickness of 60-100 km is characterised by random fluctuations of velocity with variance ΔVP = 2%, and horizontal and vertical size Δx = 20 km and Δy = 0.5 km, respectively. Author(s): Guterch A., Grad M.
A large seismic experiment POLONAISE'97 (POlish Lithosphere ONsets - An International Seismic Experiment) targeted the deep structure between the Phanerozoic and Proterozoic European crustal domains (Guterch et al., 1999; Jensen et al., 1999; Środa et al., 1999; Czuba et al., 2000). It was focused on the structure of the Palaeozoic belt (along profile P1) and East European Craton (along profile P3). The crustal thickness beneath profile P1 is about 30 km. Depth of the consolidated basement with velocity of 5.8 km/s is about 10 km; however, relatively low velocities < 6.0-6.1 km/s are observed down to 18-20 km depth. The lower crust is characterised by high velocity gradient (~6.8-7.2 km/s) and high ringing reflectivity. The velocity in the uppermost mantle is high: 8.3-8.4 km/s. The crustal thickness beneath profile P3 is about 42 km. Depth of the basement is about 5 km, and three parts of the crystalline crust have velocities about 6.1, 6.5 and 7.1 km/s, respectively. The velocity in the uppermost mantle is 8.05-8.1 km/s. The crustal and lower lithosphere velocity structure is different between the two sides of the Polish Basin. Very distinct asymetry between the maximum thickness of the sedimentary cover in the Polish Trough (16-20 km) and the crustal root (~45 km) associated with TESZ was found. A large consortium of institutions (28 in all) from Europe and North America has completed in June 2000 a huge active source seismic experiment focused on Central Europe (Guterch et al., 2000). This experiment is called CELEBRATION 2000 (Central European Lithospheric Experiment Based on Refraction, June 2000), and it targeted the structure and evolution of the complex collage of major tectonic features in the TESZ region, as well as the southwestern portion of the East European ceaton, the Carpathian Mountains, the Pannonian basin, and the Bohemian massif, CELEBRATION 2000 was built on the productive collaborations established during the POLONAISE'97 experiment. The layout of the experiment was a network of interlocking profiles whose total length was about 9000 km, with 147 big shots recorded by 1230 seismic stations. In summary, POLONAISE'97 and CELEBRATION 2000 have produced a massive data set that will provide, jointly with older seismic profiles LT-7 and TTZ (Guterch et al., 1994; Grad et al., 1999) a 3-D picture of the crust and lower lithosphere in one of the most tectonically complex region of Europe. This publication has a character of some historical recapitulation. Nearly fifty years have elapsed since the electromagnetic induction methods had been first applied to the study of regional deep geophysical structures. The two complementary methods have been developed: magnetovariational method (also called the geomagnetic sounding) and the magnetotelluring one. Both have beenused by the research group of the Institute of Geophysics, Polish Academy of Sciences, and the present publication summarized this study and discusses the results. In terms of regional investigations, worth underlining is the determination of the Permian basin axis, and the finding that the main influence on the features observed at the surface is exerted by the induction in the sedimentary basin. The main achievements include the discovery, and then thorough interpretation, of the Carpathian anomaly; this was made jointly with the colleagues from Czechoslovakia. Alongside, we have been working on new research techniques; the designing of new instruments, and the development of data processing and modeling methods, still drawing the attention to the limitations of the methods in question. Author(s): Gibowicz S., Lasocki S.
Although rapid development of research on seismicity in mines began in the second half of the last century, the first attempt to monitor mining-induced seismicity by seismic instruments was undertaken in the Ruhr Basin as early as 1908. At present, there are tens of underground seismic networks in operation in deep mines all over the world, and modern observational techniques permit to locate instantly seismic events occurring there, to estimate their strength and their association with local geological and tectonic structures and mining situations. Digital recording systems, introduced into mines during last 10-15 years, permit to study in detail the focal mechanism and source processes of these events. Such studies ensure reliable assessment of time-dependent seismic hazard in mines, connected with large seisic events, often associated with serious underground damage. A brief description of these problems is given in this review. The paper presents a short review of statistical methods in earthquake modelling. Earthquake models correspond to complex dissipative systems driven by slow pumping of energy. They are non-equilibrium systems but it was found that they fluctuate around the time-average state. Therefore, they are in fact isomorphic to equilibrium models, and extremely powerful set of methods and results for equilibrium systems would be immediately available. The set includes methods of statistical mechanics and statistical physics of phase changes. It seems that complex fault systems operate near the critical state and models of second-order and first-order phase transitions were used to the earthquake processes. These are percolation models, cellular automata models and self-organizing spinodal model. All the critical models lead to the power distributions, which are characteristic for earthquakes and many other geophysical phenomena. Apart of the critical models the paper presents a stochastic approach in which the "privilege" is responsible for the appearance of fractal distributions. The "privilege" means the susceptibility of the state onto a change. The model is based on the master equation and it can be applied to the percolation theory and the cellular automata. There is a relevance between the privilege concept and the non-linearity of the model. A general mechanism of earthquake rupture has been proposed by Reid at the beginning of last century. However, field observations and laboratory experiments provide us with much detailed and complicated image of seismicity than 100 years ago. Therefore, much more detailed models are needed to understand the phenomena. It is an objective of physics of earthquakes, by using observations, laboratory experiments, theoretical considerations and computer simulations, to propose such models. In this paper some important aspects of seismicity and physics of earthquakes are presented. Then, two different theoretical models of earthquakes are described. It is shown how the two models, based on the state- and rate-dependent friction and the slip-dependent friction, respectively, can be used to explain the details of seismic activity. Author(s): Teisseyre R., Majewski E.
The paper is a review of various approaches to the earthquake physics and rock failure processes. We outline classical seismological approach to the rock failure dynamics in the rupture region of a tectonic fault zone, and microscopic approach to the failure phenomena related mainly to the statistics of microcracks. Then we discuss the defects in a continuous medium and the theoretical treatment of such a medium. Subsequently, we present the earthquake thermodynamics and some results obtained in terms of defect thermodynamics. Finally, we suggest that the statistical physics applied to complex states and critical states may be a very promising tool for explaining some relationships governing the earthquake processes. Civilization of XXI century will be more and more dependent on satellite technologies for defence, communication, navigation, geodesy, monitoring of ecological danger, search for natural resources, and the scientific research in many fields. Advanced satellite technologies are very sensitive to conditions in the near-Earth space. The need of "space weather" forecasting stimulates the vigorous research activity in heliophysics and space physics. In the paper we described the most important solar structures and processes of Sun's activity as well as related to them "meteorological" events in the near-Earth space and their practical consequences. The particular importance of the instantaneous ionospheric mapping to synoptic applications is noted. The very specific requirements concerning data evaluation are presented. Instantaneous mapping techniques applied to geographically irregularly spaced ionospheric characteristics can lead sometimes to non-physical results. A procedure is presented to avoid such problem which makes use of: a) different interpolation methods in terms of deviations between the measurements and corresponding figures given by the long-term mapping method, b) screen points within the area of interest having values from elaborated single station models, electron concentration height prifile model, ionospheric characteristics forecasting model and the model of the mid-latitude ionospheric trough. A way of elaboration of the mapping model applied to ionosphere is demonstrated, together with analysis of the accuracy achieved. Physical and technical applications are presented. Fluctuations (scintillation) of radio wave parameters may severely degrade the performance of satellite navigation systems and generate errors on transionospheric radio links. Since ionospheric scintillation originates from random electron density irregularities acting as wave scatterers, research on the formation and evolution of irregularities is closey related to scintillation studies. In this paper we briefly describe some aspects of the scintillation theory and review physical mechanisms of irregularity formation in the equatorial and high-latitude regions. We also present the WBMOD global scintillation model, useful in the predictions of disturbances on the satellite radio links. Ionosphere - the ionized part of the upper atmosphere of the Earth - is a natural plasma laboratory. The plasma that occupies it has various physical parameters, and even various composition, depending on the altitude. Physical phenomena in the plasma may be diagnosed from the Earth's surface by electromagnetic waves, or in situ from rockets or satellites. The phenomena in the plasma may be also actively evoked by high-power electromagnetic waves or beams of electrons or ions injected from spacecraft into the ionosphere. Experiments of this type, called active plasma experiments, will provide information on both the plasma processes and natural geophysical phenomena.